"Within a few pages, Laura Vanderkam's crisp, entertaining book convinced me I had time to read it. Then it convinced me I had time to reread War and Peace. In the original Russian. Thank you, Laura, for freeing up my schedule." "We so often live our lives day by day. Laura wants us to think about doing it hour by hour. Living this mantra by example, she gets more done in a day than most of us do in a week." "168 Hours is filled with tips and tricks on how you can be more efficient every day. By being more productive at work and home, you'll create more free time to focus on the truly fulfilling activities in your life, rather than the simply mundane." "In 168 Hours, Vanderkam packs mounds of real-world case studies and experience to substantiate her system-and I fully agree. You can improve your mastery of time with this invaluable book." -Dave Crenshaw, author of Invaluable and founder of Invaluable, Inc.
"168 Hours should be an eye-opener for every one of us who leads a busy, hectic life. Reading it made me appreciate how much 'true' amount of time I really have and how to use it wisely and optimally to boost productivity, efficiency, and joy." 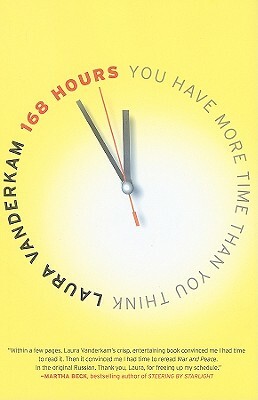 "Laura Vanderkam shows us how to use our only real wealth-our 168 hours a week- to make our lives richer, not busier. That's a wonderful gift, because it's what genuine success is all about." "Laura Vanderkam's fluid style and perceptive eye are just the right tools to help create the life of your intentions. 168 Hours is the antidote to 'living for the weekend.'" "This book is a reality check that leads any reader to say, 'I do have time for what is important to me.' Full of real life examples, Laura Vanderkam teaches how to pack what matters most into both your work and home life. A must read if you are looking for life-changing strategies to make your next minute, hour or 168 Hours more meaningful." "We predict that 168 Hours will fly off the shelves and into the hands of anyone who has ever uttered the words: 'I'm SO busy!' or 'If only I had more time!' Vanderkam's approach is incredibly powerful and resonant given the average American watches 4 hours of television. A day!"